"Purchasing seems like a very rational kind of thing, but in fact we don't make decisions rationally. We make decisions emotionally.6"
A recent trend in advertising, dubbed ‘sadvertising,’ seeks a stronger emotional response from buyers, and to tell a story that connects with people. Technology companies have employed this tactic successfully in recent product ads, as in these examples: “No White Flags” (Microsoft), “Dear Sophie” (Google) and “Chérie's Verse” (Apple). 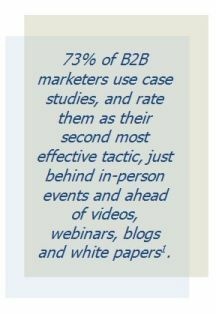 Effective B2B case studies also resonate with buyers emotionally, satisfying the need for connection. The customer’s own words forge that connection better than any marketer’s prose. People relate to other people, their stories, their challenges and their success. One month after launch, the founders of a NYC IT services company entered the World Trade Center on 9/11, just before the first plane hit. The experience forged a business continuity mindset that their small business customers relate to well.